March 20, 2019 / Modified mar 20, 2019 3:55 p.m. 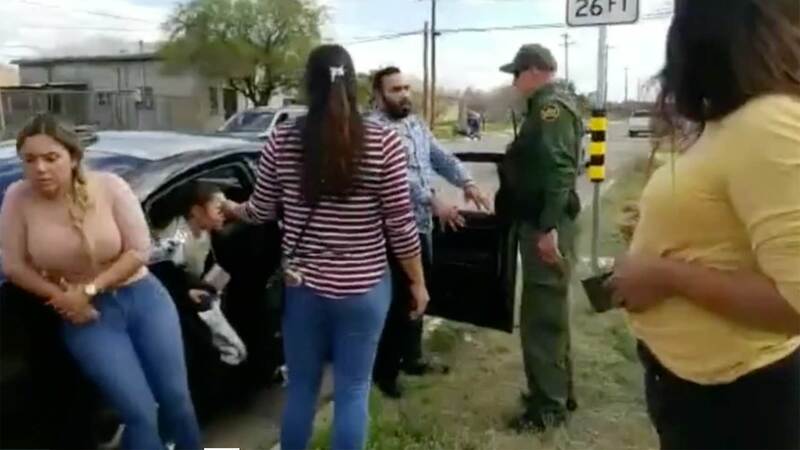 Still image of video posted to social media of a Border Patrol arrest on Tucson's south side, March 19, 2019. Community members protested the actions of Border Patrol agents on Tucson's south side Tuesday afternoon, trying to prevent a family from being taken into Border Patrol custody. As the crowd grew, Pima County sheriff's deputies, Highway Patrol officers and Tucson Police arrived on the scene. The crowd was chanting, "Let the child go," as 12-year-old Dariana Torres de la Vega sat alone, crying in the back seat of an unmarked police vehicle. She saw her mother and father being arrested by Border Patrol. The arrest was shared live on social media by Jessica Rodriguez, a bystander who encouraged viewers to show up on the scene. "If people can come to 22nd and 9th, they are taking the family into custody, and the child — she is a U.S. citizen." As the crowd grew, protesters demanded a Border Patrol agent explain why the couple, and their daughter, were being arrested. The agent could be heard on video saying that the family did not have a visa to be in the country. A family member who showed up at the scene claiming to be an aunt said the child, a U.S. citizen, was separated from her parents and that the arrested couple had two more U.S.-born children at their Tucson home with other family members. Customs and Border Protection spokesman Daniel Hernandez disputes that assessment. "First of all, the information is not accurate. But I'll have a statement for you — I was told would be ready within the hour. " As of publication time there was no official word from CBP as to where the family is being detained or if the child has been separated from her mother and father. Border Patrol Detains Family + Civil Disobedience from Alicia Dinsmore on Vimeo.